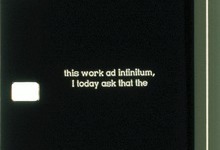 "Infinitesimal Art" (which goes far beyond its "conceptual" plagiarism by its scope and depth of invention) is a field that is "based", according to Isidore Isou, "on particles devoid of any immediate meaning, where each element exists as much as it allows us to imagine another non-existent or possible element." Thus, some of Maurice Lemaître's works displayed in this program present elements that must always remind the viewer of something else. 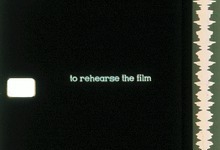 The Supertemporal Framework (which goes far beyond the neo-dada substitute called "happening") does not limit itself to bringing about events prepared in advance, whose authors are the artists themselves, but offers a platform that constantly overcomes and integrates time, because it opens the work totally to spectators, who are asked to bring their own creative dimension to it, to infinity.